This is a little twist on one of my favorite breakfast foods. I tend to eat more savory than sweet so I decided to switch it up. Instead of making a sweetened toast, I used an olive loaf, topping it off with tomatoes, mint, cucumber, grilled halloumi cheese, and the legendary Black & Bolyard aleppo pepper brown butter. 2. In a large bowl toss cubed tomatoes, cucumber, mint, EVOO, and salt together – and set aside. 4. In a large cast iron skillet, melt the brown butter over medium high heat. 5. Cook each slice for 2-3 minutes on each side, or until golden brown. 6. Let the bread cool, and sear the halloumi cheese for 2 minutes until the edges are crispy. 7. 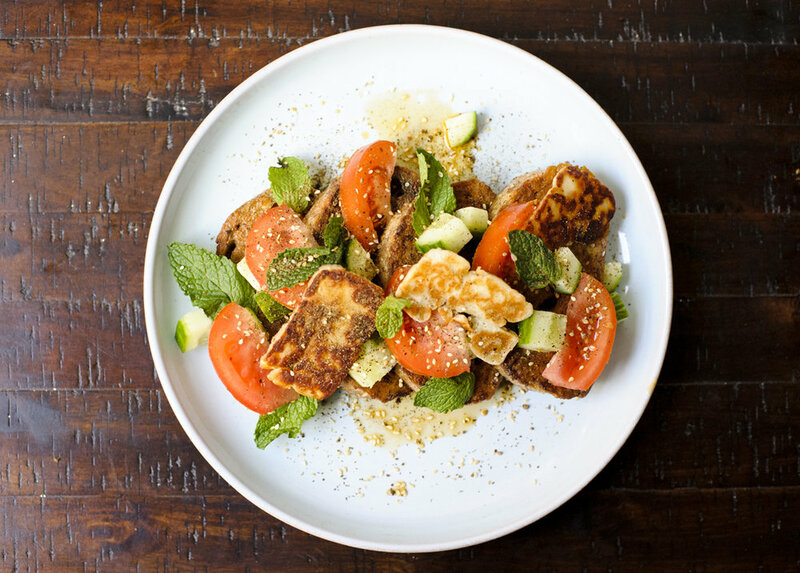 Assemble the toast by adding a slice of halloumi, and a scoop of salad. 8. Finishing it off with melted brown butter, and za'atar.